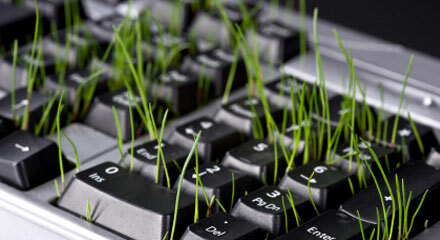 In business settings, “eco-friendly” is the new watchword – companies are scrambling to make their processes (from mass production to the purchase of toner cartridges to the disposal of wastepaper) less polluting and kinder to the environment. But these changes don’t just need to happen at the corporate level. 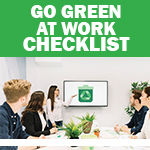 You as an individual business owner or employee can do your part to help “green-up” your own office. 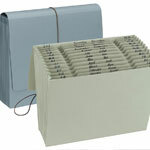 The manufacture of office supplies is a highly resource-intensive one. 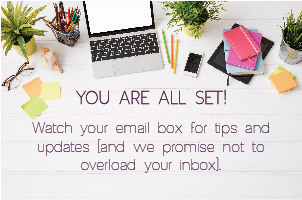 Hanging files, manila folders, printer paper, envelopes, sticky notes, business cards – they all require the chopping down of forests. 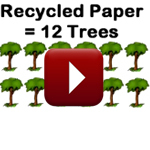 But when you buy these products recycled, they require about half the pulpwood – a ton of “virgin” office paper uses 24 trees, while a recycled ton only uses 12 trees. Another big issue is the ink with which you print. Over 350 million toner cartridges are added to landfills every year, with each cartridge creating 3.5 pounds of solid waste that can take up to 450 to 1000 years to decompose. But simply choosing to refill rather than buy new completely eliminates this problem. 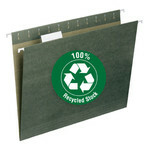 And there really is no excuse not to shop in the “recycled aisle,” now that office supply companies like Smead offer more “eco-friendly” versions of every product imaginable. That leads me to another bad habit we’ve developed regarding office supplies – throwing an item in the trash or recycle bin after only one use. We’ve become a very “disposable” society, spoiled by inexpensive manufacturing techniques and an overabundance of consumable goods. But we’re paying the price – using up our natural resources faster than they can be replenished, and polluting our environment with our wastefulness. 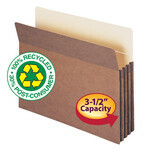 However, you can make your office supplies last longer with just a little forethought. For example, how many file folders do you pitch each year because you no longer need that category of information? Who says you can’t simply re-label and re-use? 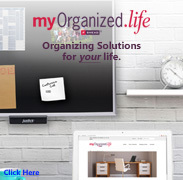 If you choose hanging files instead of manila folders, you can more easily swap out labels when the contents change. Or, at the very least, get in the habit of using labels instead of writing directly on the file for quick removal. 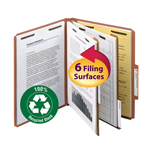 Also remember that manila folders can be turned inside out and used again. All it takes is a simple shift in the way we view our work processes to save the planet!